Summer is abloom at Nachusa Grasslands, where the warmth of July is igniting an explosion of color. Purple coneflowers point to the sky. Big bluestem grass sways in the breeze. Monarch butterflies flutter among delicate pink milkweed flowers. 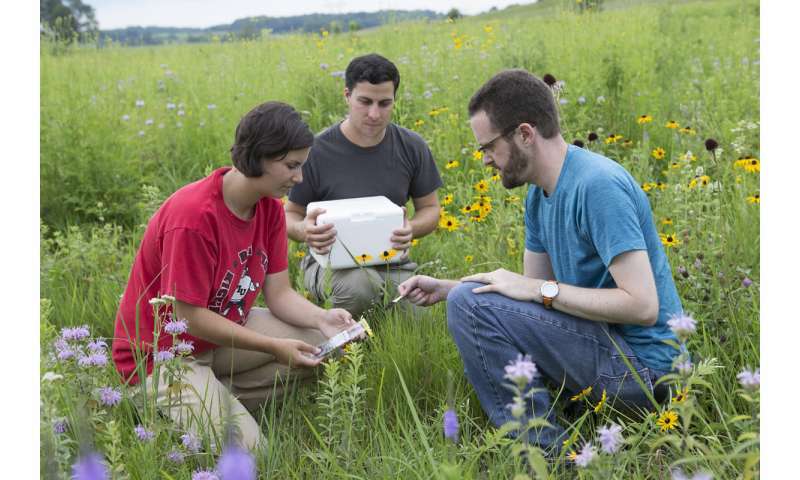 Though invisible to the naked eye, something equally amazing is happening beneath the dazzling array of flora at the 4,000-acre preserve near Dixon, Illinois, according to Northern Illinois University scientists. In a new study published in the journal of Environmental Microbiology, Northern Illinois University biological sciences professors Nick Barber and Wes Swingley say they have found evidence that the soil microbiome is reaping the restorative benefits of nearly three decades of carefully managed tallgrass prairie restoration at Nachusa. "Diverse bacterial communities are recolonizing the soils," Swingley said. "These communities closely resemble those in untouched natural prairies, despite no direct efforts at reclaiming soil functions." Owned and operated by The Nature Conservancy, the Nachusa Grasslands preserve consists of large remnant prairie, woodlands and wetlands reconnected through habitat restoration to create one of the largest and most biologically diverse grasslands in Illinois. "It's particularly noteworthy that restoration efforts at Nachusa are producing successes that extend beyond plant and animal biodiversity," Barber said. "We found strong evidence that over time bacterial communities in the soil of sites restored with native prairie plants come to resemble the communities found in remnant prairies," he added, saying that very little was previously known about what was happening to bacteria in the soil of restored grasslands. "This is exciting news because it means the restoration is working at this foundational level," he said. "Not only do we see beautiful plant diversity, but underneath the plants we find diversity in the soil, with bacteria that are recolonizing and recovering on their own to resemble what once lived in prairie systems throughout Illinois." Restoration and management of natural ecosystems is a critical strategy in mitigating global biodiversity loss, a crisis that some scientists believe is a greater threat to our planet than climate change. Prairies are highly diverse ecosystems that, as drivers of clean air and water, also contribute to the health of people and the planet. While North American tallgrass prairies once stretched from southern Canada to Texas, they now represent one of the most widely destroyed ecosystems on the planet, with more than 90 percent of original prairie lost. In Illinois, more than 99 percent of the prairie has vanished, replaced primarily by row-crop agriculture. Starting in the late 20th century, restoration efforts targeting these lost prairie ecosystems have become widespread, though they still represent islands in a sea of farmland. Basic questions also linger over what should be the goals of a restoration, how fully a tallgrass prairie can be restored and how quickly recovery can be accomplished. "Our work shows that restoration of a single element of the ecosystem, namely plants, can have beneficial effects downstream in other areas," Swingley said. "We found that some soil microbial groups recovered from agricultural states within the first three years after restoration, whereas full recovery of known prairie microbial groups took 15 to 20 years," he added. "This is a shockingly fast recovery." Restoration efforts typically include the re-establishment of diverse native plant communities, control of exotic plant species and implementation of regular activities that mimic natural periodic disturbances, such as fire and animal grazing. Bison were re-introduced to the Nachusa Grasslands in 2014 to re-establish their historical impacts as native grazers. While microorganisms within soil are tiny, they play large roles in the environment, providing nutrients to plants and forming the base of a food web. Yet very little detail is known about the roles of different soil bacteria and fungi. "Soil often gets the short shrift," Swingley said. "Scientists don't really know what each microbe in the soil is doing and how they are all working together—and these are important questions for ecology, as well as for agriculture." For their study at Nachusa, the scientists characterized soil bacterial and archaeal communities in 13 tallgrass prairie plots ranging in restoration age from 1- to 27-years old. Using a combination of field, laboratory and computational techniques, soil communities were compared to one another as well as to local remnant prairies and nearby farm fields using DNA sequencing. "All lines of evidence point to the soil in older restorations most closely resembling local remnants," Swingley said. "It's a profoundly positive result of decades of hard work by The Nature Conservancy and managers at Nachusa."